Divine cakes and heavenly lemon squeezers - Düsseldorf, Deutschland - THE LINK – Stadt. Land. Architektur. Düsseldorf. Essen. Köln. Deutschland. Advertisement. 2017, the 500th anniversary of Luther’s 95 Theses, is a major event on the Rhine and the Ruhr. 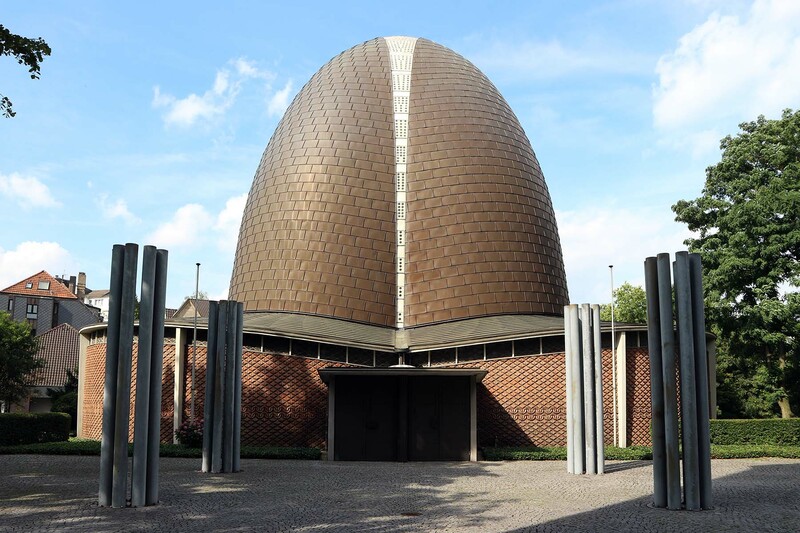 We took a look around the #urbanana area, since the 20th century witnessed outstanding sacred architecture built here by great church architects like Otto Bartning, Domenikus Böhm, Fritz Schaller, and Rudolf and Maria Schwarz. In our two-part series, we present both renowned and lesser-known churches. 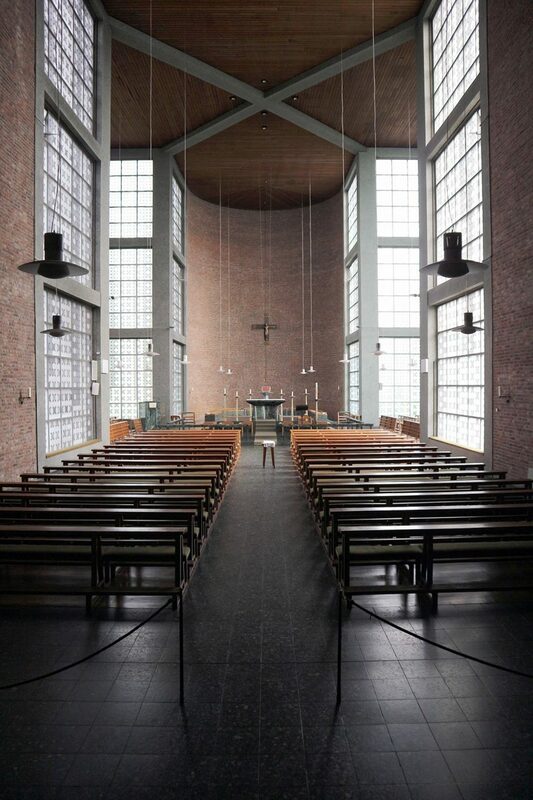 Several architects built impressive and unusual churches on the Rhine and the Ruhr rivers during the 20th century. 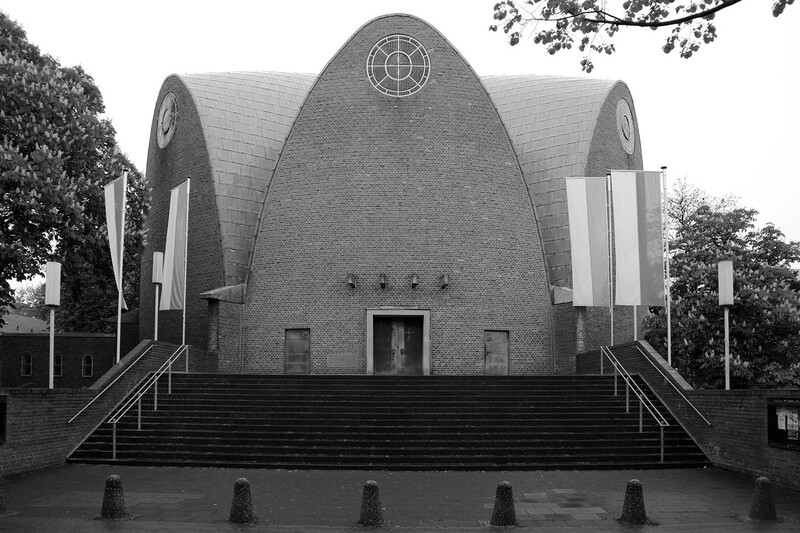 In 1930, Otto Bartning designed the first evangelical church of the modern era for Essen, and in 1932 the Catholics followed suit. 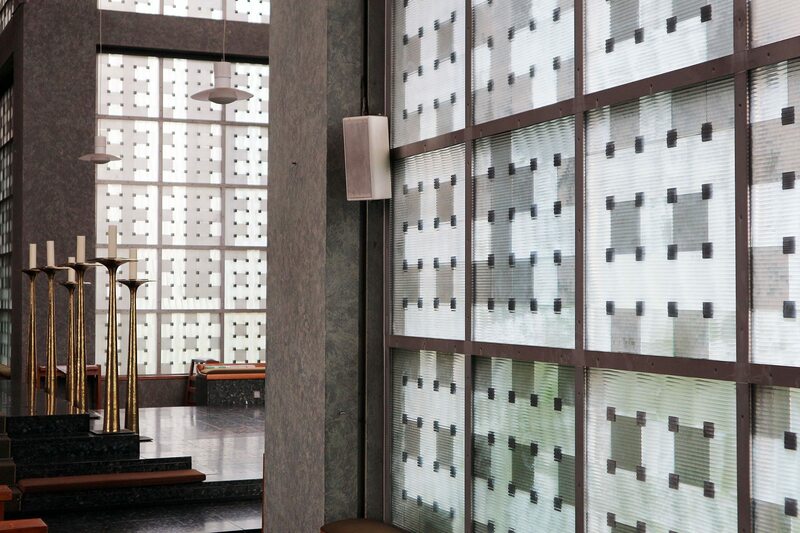 Their first modern sacred building stands in the Archdiocese of Cologne. 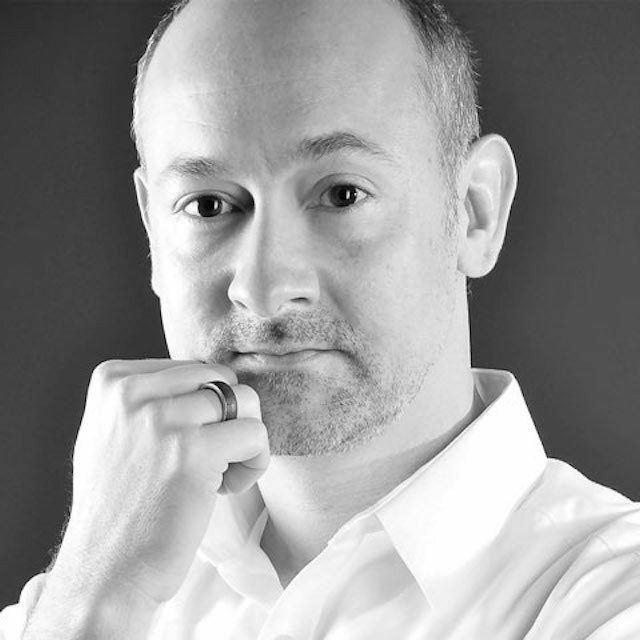 Its architect, Domenikus Böhm, was one of the most influential church architects in the nation. 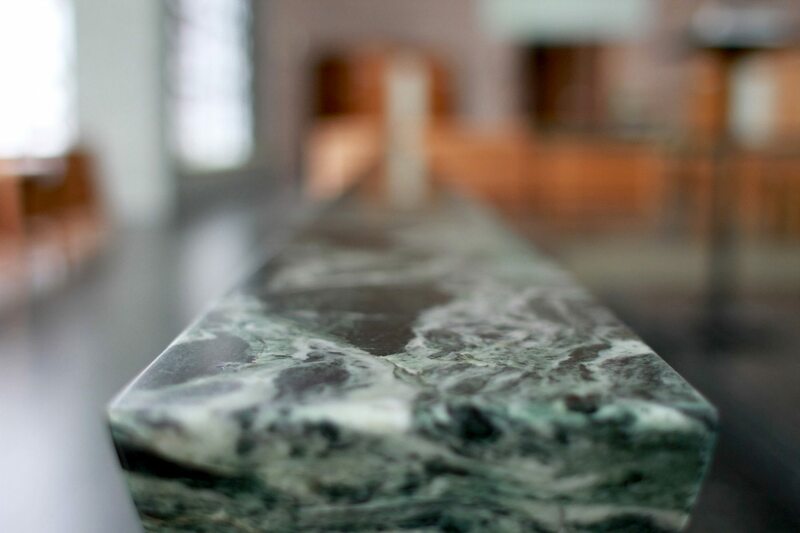 He, his sons and his grandsons have enriched the landscape of German sacred architecture up to the present day. In addition to these buildings, there are works by Fritz Schaller and Rudolf and Maria Schwarz. Besides Christian buildings, we also encounter Jewish and Islamic buildings. Many of them only began to be appreciated years after their construction. In our tour, we chose a selection of these works and have organised it chronologically. In the southeast quarter of Essen stands a major building of modern European church architecture. 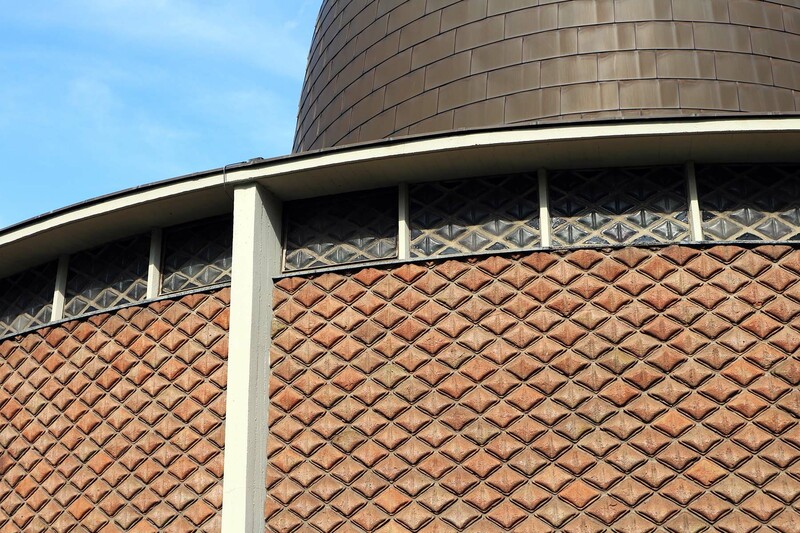 Layered and circular, the Evangelische Auferstehungskirche (Evangelical Church of the Resurrection) was nicknamed 'the Cake' by its parishioners. Others ironically call it 'the Circus'. 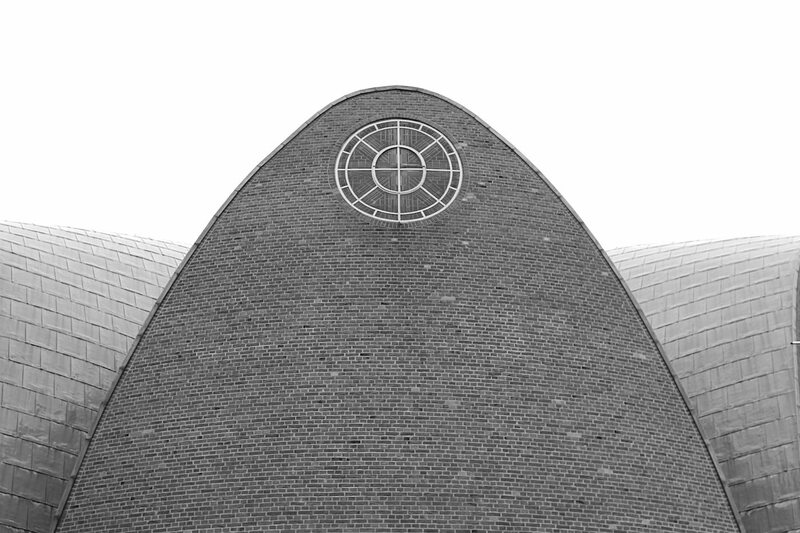 Otto Bartning let himself be led by the concept of 'Liturgy as Builder' in his design. In the centre of the space stands a copper baptismal font with a baptismal verse engraved on it. Bartning arranged the community with minimal spacing in a ring around the preacher. He placed the pulpit on the same level as one of the curved sections. One of his most important motivations was to create a sense of nearness. The church is also a masterpiece of construction, 30 metres high and wide. It was erected with a skeleton construction, naturally and confidently made out of local Krupp steel. In order to protect it from corrosion, it was finally covered in concrete. Bartning had the infill executed in brickwork. 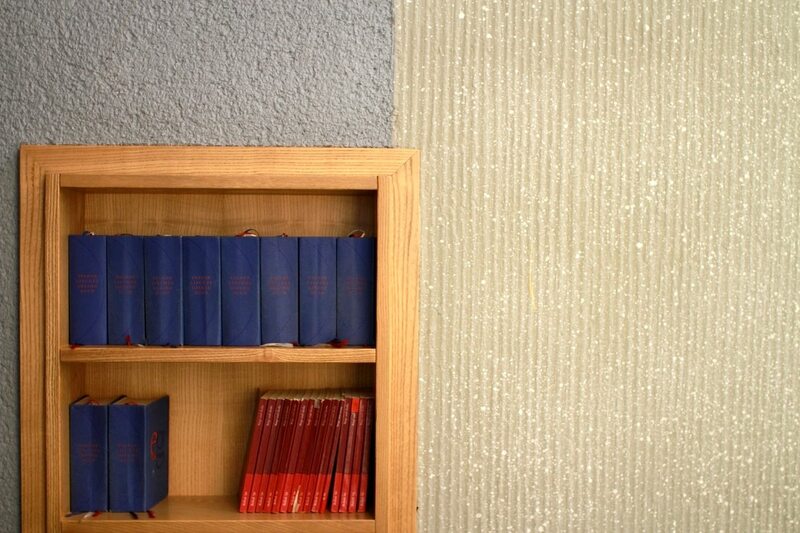 The choice of materials was simultaneously a recognition of the modern style and of the regional building style of the Ruhr area. For example, the brick mining buildings of the time were similarly sober, monumental and resilient. 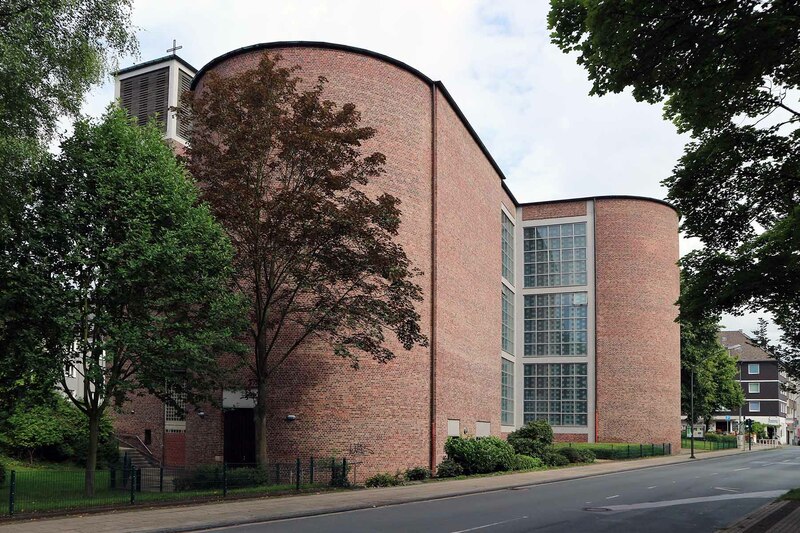 About as unloved as Bartning's round church when it was first constructed was Domenikus Böhm's Catholic church in Cologne-Riehl. Today, it counts among the most groundbreaking sacred buildings of the early modern period, thanks to its virtuosic use of reinforced concrete, and has had enormous influence all the way over to America. 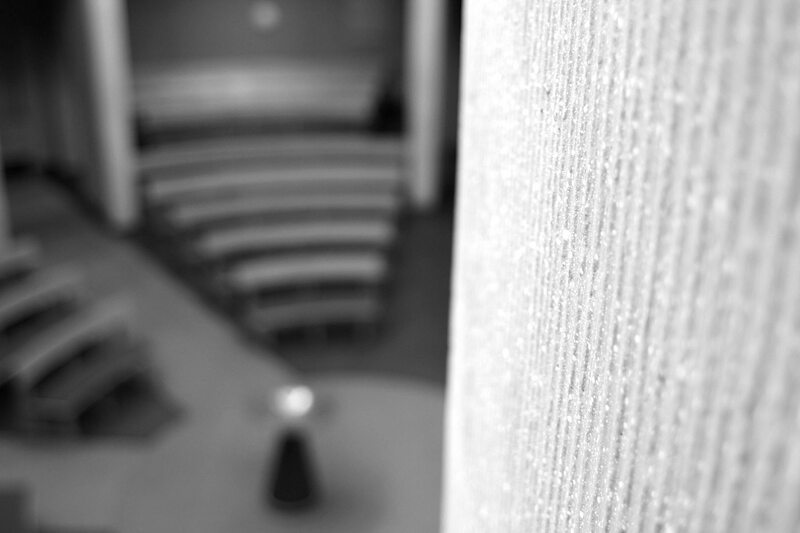 The central building stands on a raised plinth. 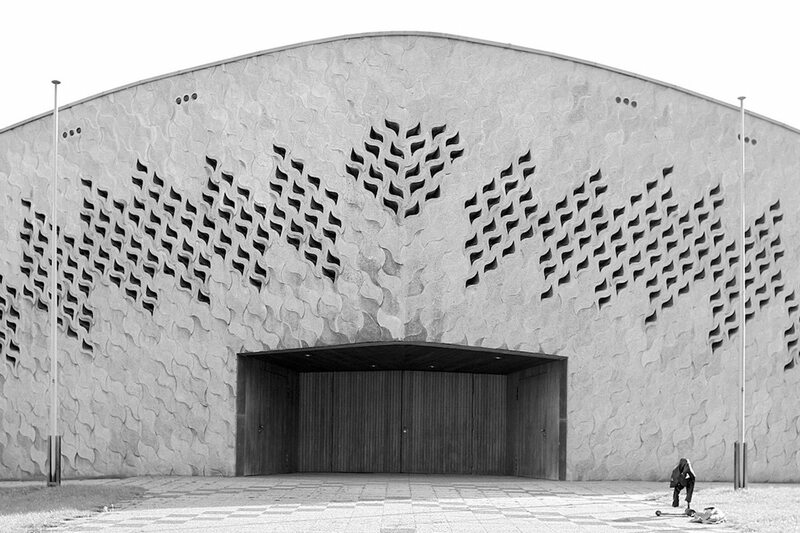 Eight parabolic reinforced concrete walls arise from a circular floor plan. 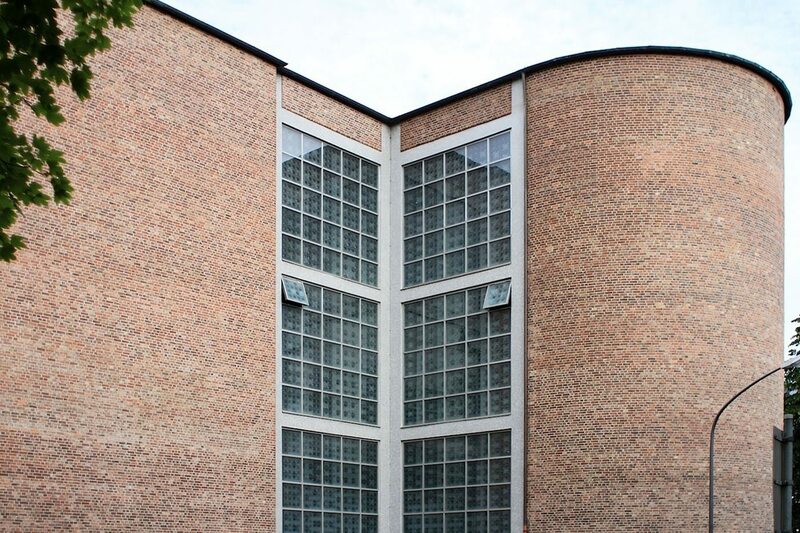 On the outside, they are clad in brickwork. Deep barrel vaults create a shimmering bluish ceiling. Like a light tent, the interior shines through the ridges, which likewise rise up parabolically. For Böhm, the parabola symbolises detachment from the Earth. Thus, St. Engelbert also represents the search for a new liturgical permeation of space at the beginning of the 20th century. The building owes its juicy name to its expressive form. In Cologne's vernacular, it's called the 'Zitronenpresse' – the lemon squeezer. 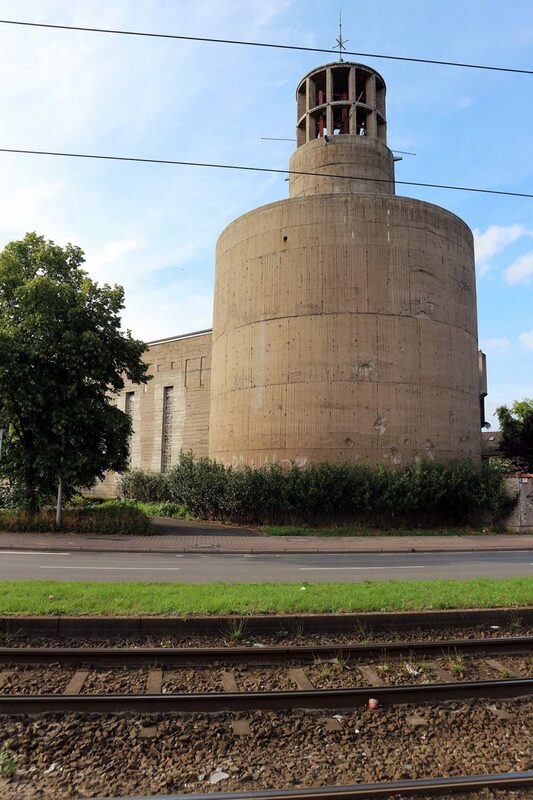 Originally, the Dusseldorf hall church of Sankt Sakrament (Holy Sacrament) was constructed as an air raid shelter, with the austere name of Typ LS 13. The national socialists had illegally confiscated the plot of land from the community in 1941. During the war, the colossus protected many families from Allied bombs. After the war, the new minister and former resistor Dr. Carl Klinkhammer committed himself to the conversion of this military building into a church dedicated to peace. 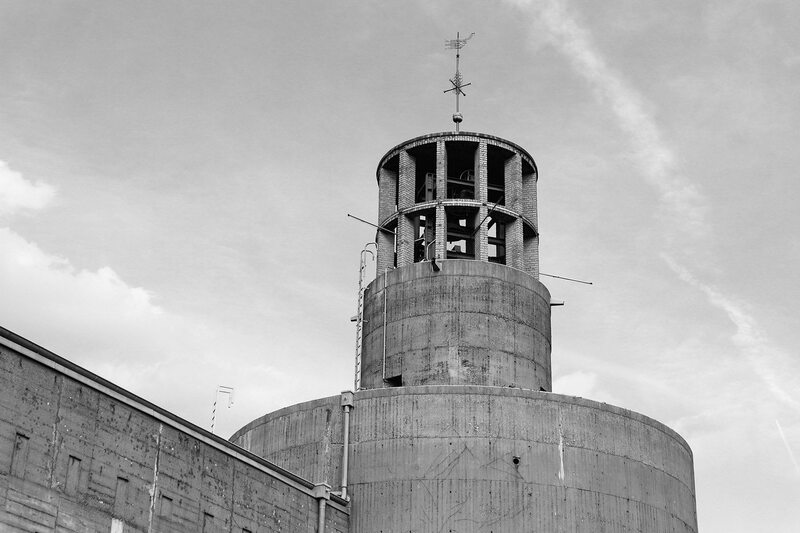 In an enormous feat, three levels of concrete as well as five window recesses arose, according to the plans of the cathedral architect Dr. Willy Weyres. Five kilometres of bore holes were necessary for this task. Some 1,000 tonnes of rubble had to be carted away. 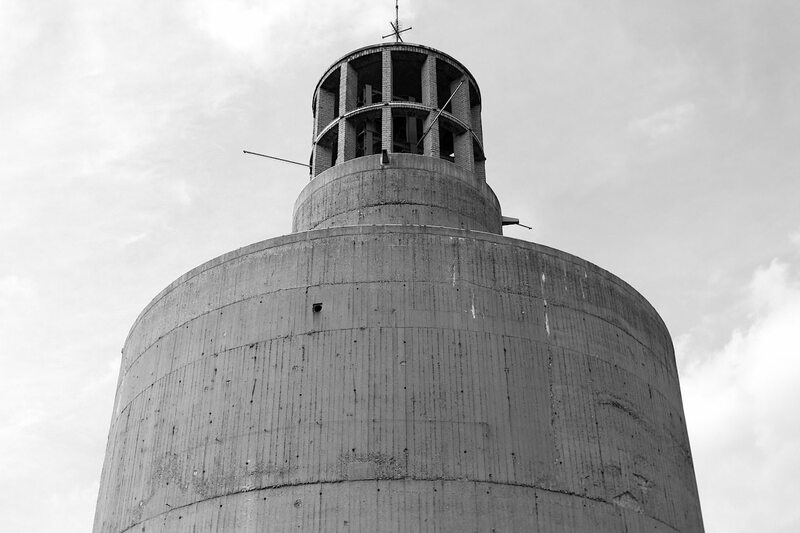 The bunker architect, Philipp W. Stang, placed a bell tower on the converted former anti-aircraft tower. Father Klinkhammer worked and lived here until his death in 1997. 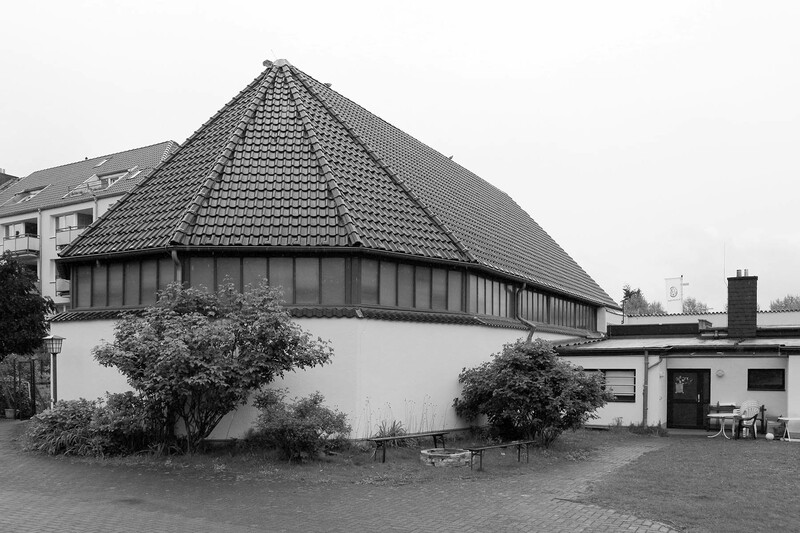 The 'Initiative Friedensort Bunkerkirche' (Initiative for a Place of Peace in the Bunker Church) was founded in 2007. According to its own description, it is committed to peace among all denominations and religions as well as the protection of the environment. Due to unsatisfied fire prevention requirements, the peace church had to close in 2017. Starting in 1945, in order to confront the sudden paucity of places of worship after World War II, the evangelical church drew up an emergency program that was in part developed by Otto Bartning. 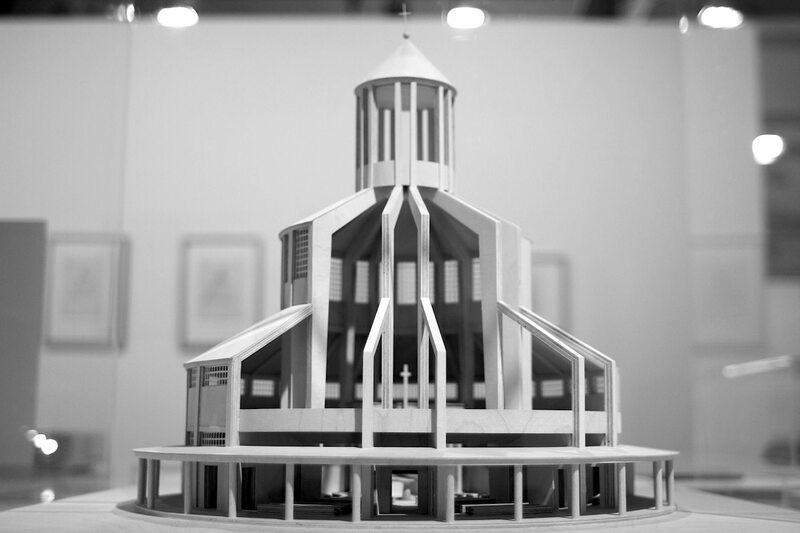 At the 1928 Internationale Presse-Ausstellung (International Press Exhibition, or PRESSA), he had already demonstrated what was possible in lightweight construction with his visionary steel church. 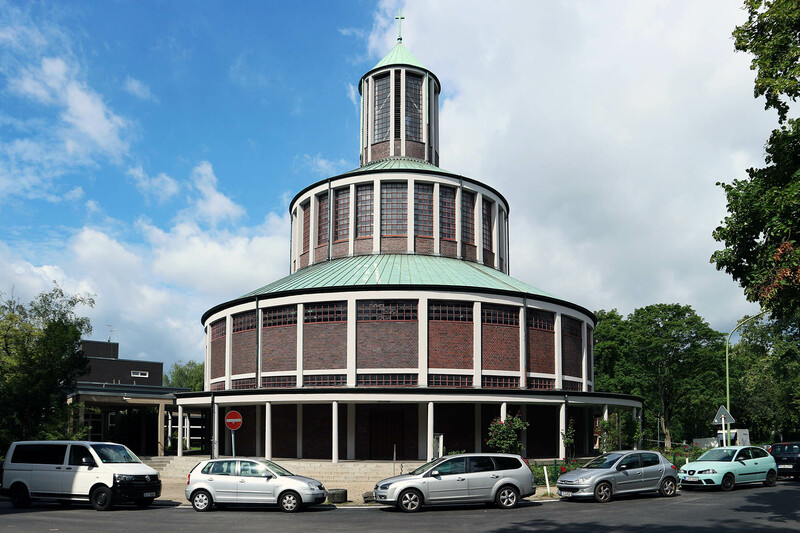 In the end, three main types of church in 43 German cities were constructed out of pre-fabricated wood elements and rubble in the context of this emergency church program. On the Rhine and the Ruhr, a few can still be seen, like the Gethsemane-Kirche in Bochum-Hamme, the Paul-Gerhardt-Kirche in Dortmund-Ost, the Apostelkirche (Church of the Apostles) in Essen-Frohnhausen and the Lutherkirche (Luther Church) in Cologne-Mühlheim. 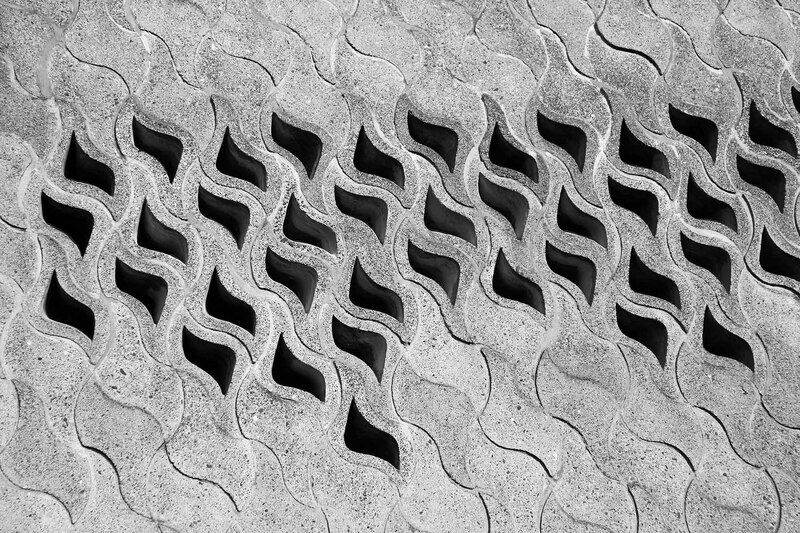 Paul Schneider-Esleben was one of the leading architects in Germany in the 1950s and 1960s. 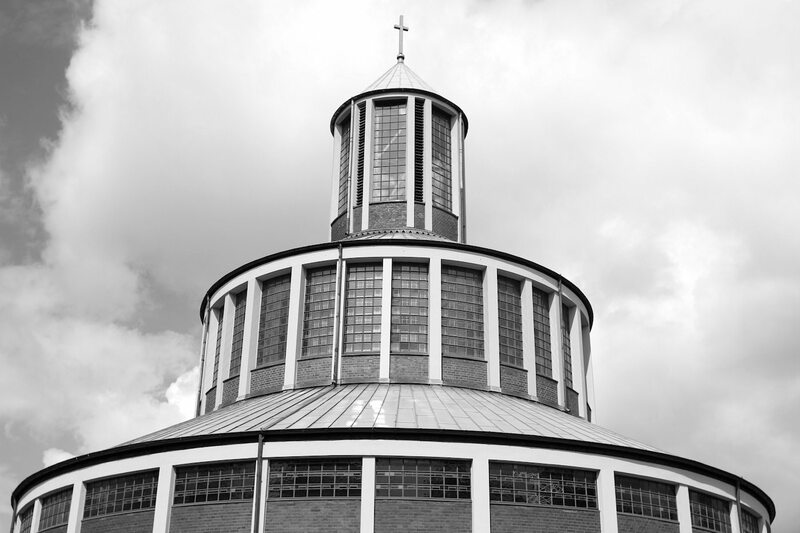 For the neoromanesque Kirche St. Rochus (Church of St. Roch), which had been damaged in the war, he designed an incomparable cupola building, which was unjustly insulted at first as a 'nuclear reactor.' 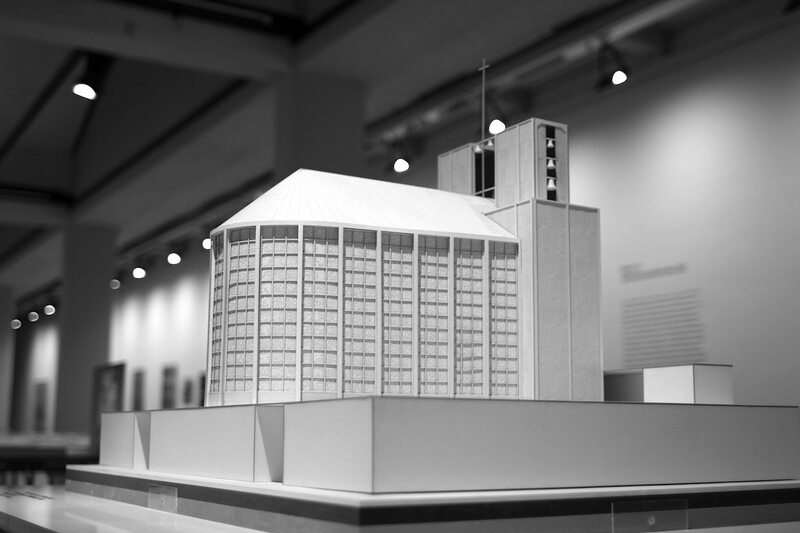 The new nave stands slightly at a distance from the enormously high ruins of the tower, which received a memorial in the form of a simple front building, designed by Fritz Schaller, the architect of the pedestrian platform surrounding Cologne’s cathedral, in 1962. 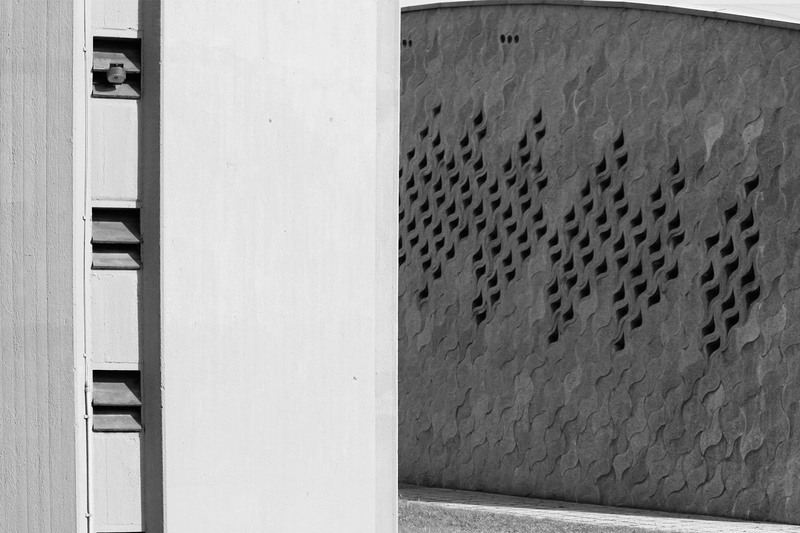 The curved outer walls are clad with rhombic terra cotta tiles decorated with reliefs. 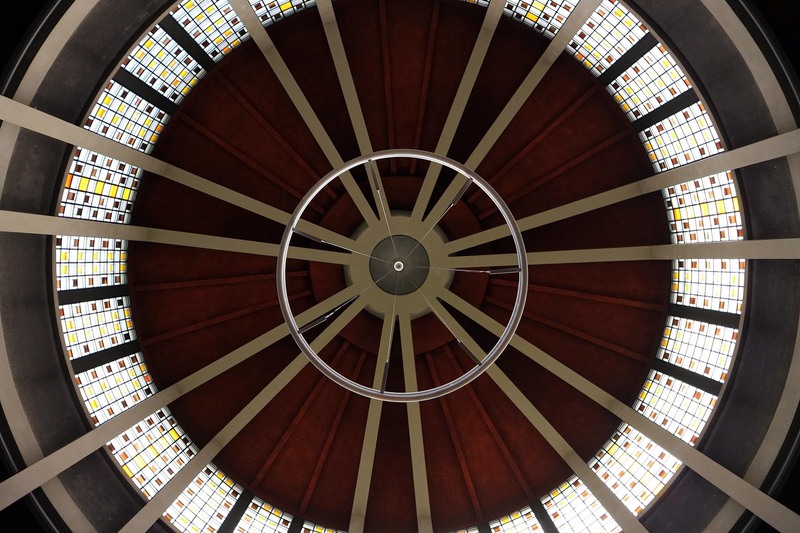 Over these, three parabolic shells, only seven centimetres thick, merge on the central cupola. 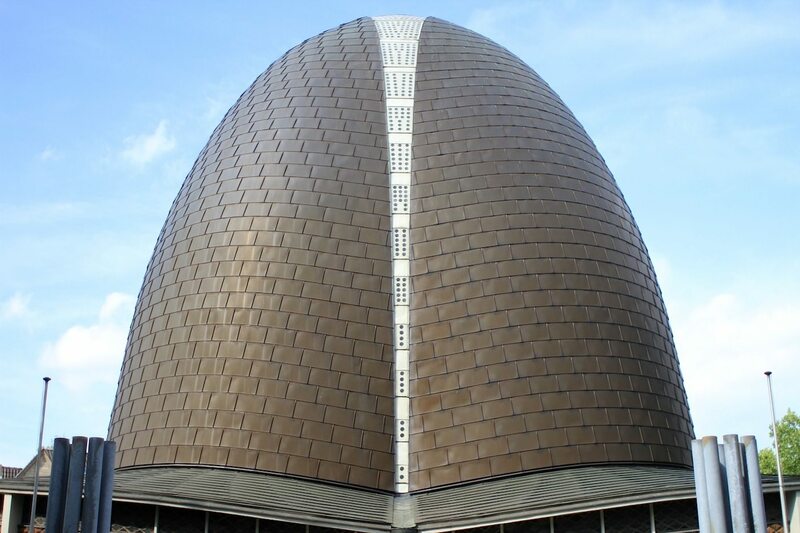 Today, the exterior is covered with treated copper plates. Too bad! Before, a light green patina gave it a special sense of lightness. The church has been a protected historical monument since 1988. 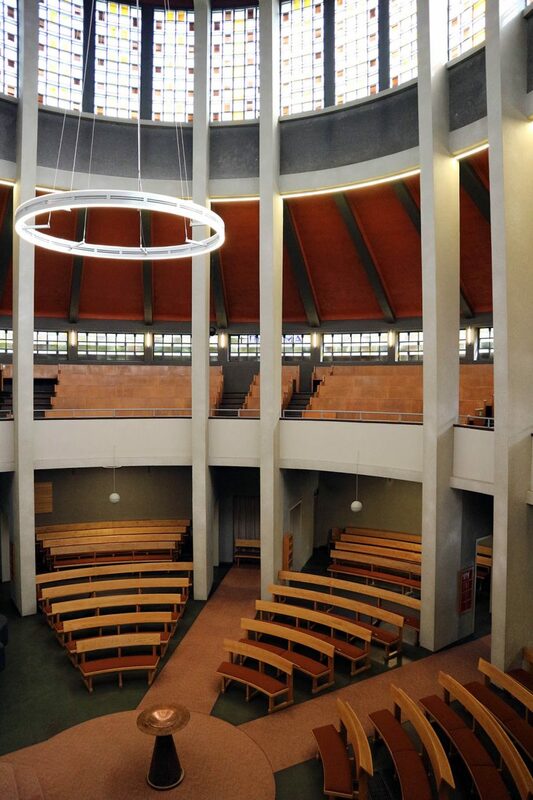 In 1938, Rudolf Schwarz published his book 'Vom Bau der Kirche' ('On the Building of the Church'), in which he summarised the typological foundations for a new direction of church building. 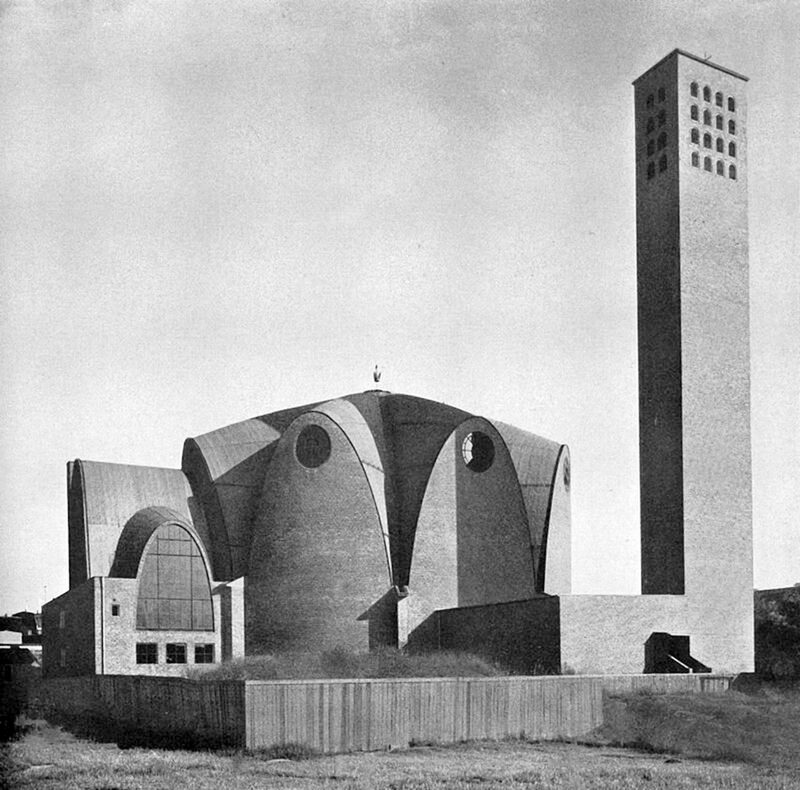 After 1945, he gave the authoritative characterisation of Catholic sacred architecture in West Germany and, together with Fritz Schaller, was responsible for the reconstruction of war-torn Cologne. His ground plan for the Kirche St. Andreas (St. Andrew's Church) in Essen looked like a romanesque cloverleaf. 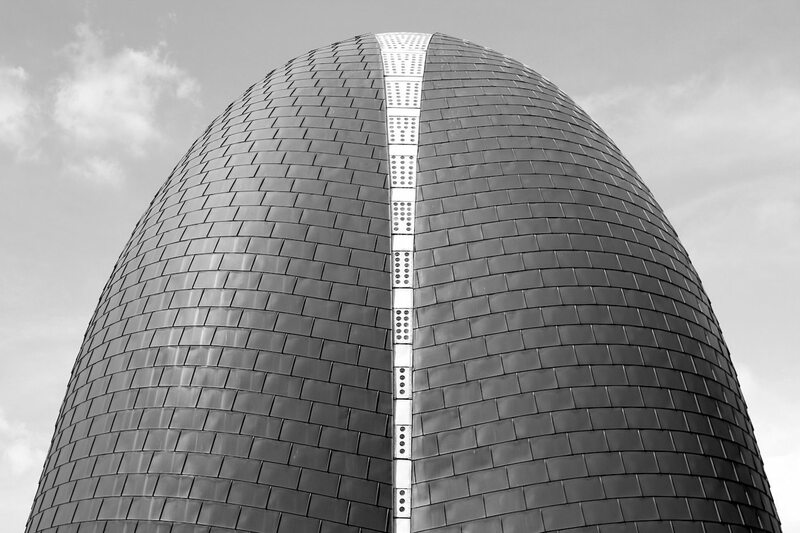 The simple building with its clear, round forms, is clad with bricks. The angular campanile stands somewhat at a distance and, together with the large, rectilinear window openings, creates a harmonious contrast. 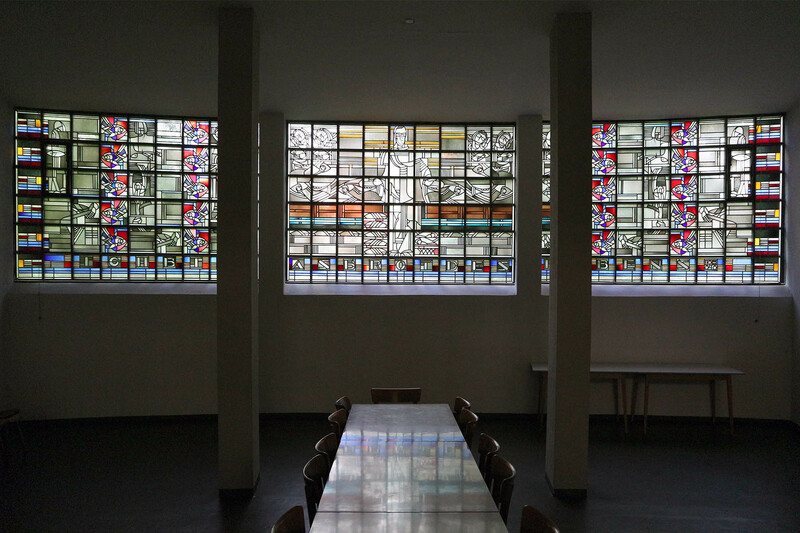 In 1994, the original glass blocks were replaced with glass art by Jochen Poensgen. He superimposed the basic form of the square on itself over and over, thus producing a clearly structured lighting effect that sets the church space aglow with many different blue tones – very compelling. St. Andreas is now under historical monument protection. The Catholic church 'Zum Heiligen Kreuz' (Holy Cross) is inconspicuous, gently set back from the street. 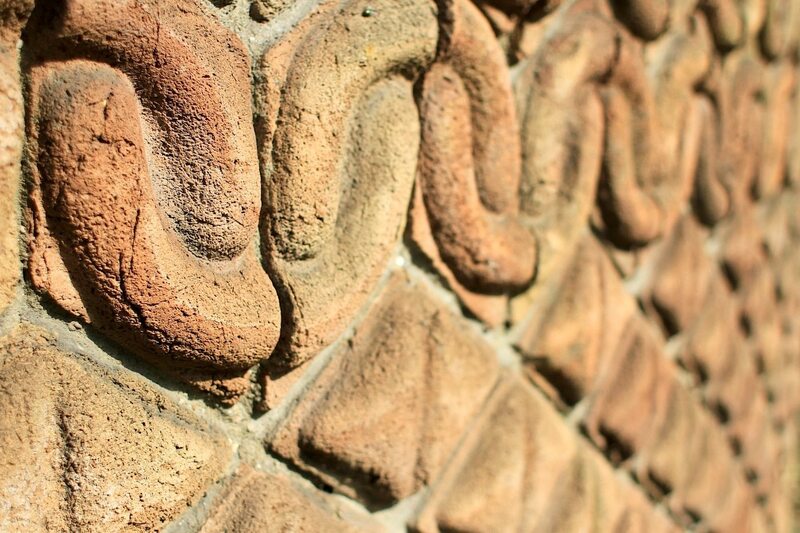 There, a single curved wall appears, consisting of around 14,000 flame-shaped pieces of artificial stone, each one lightly protruding or recessed. The free-standing campanile, with its six bells, was first added in 1964. The ceiling construction in the interior is especially beautiful. 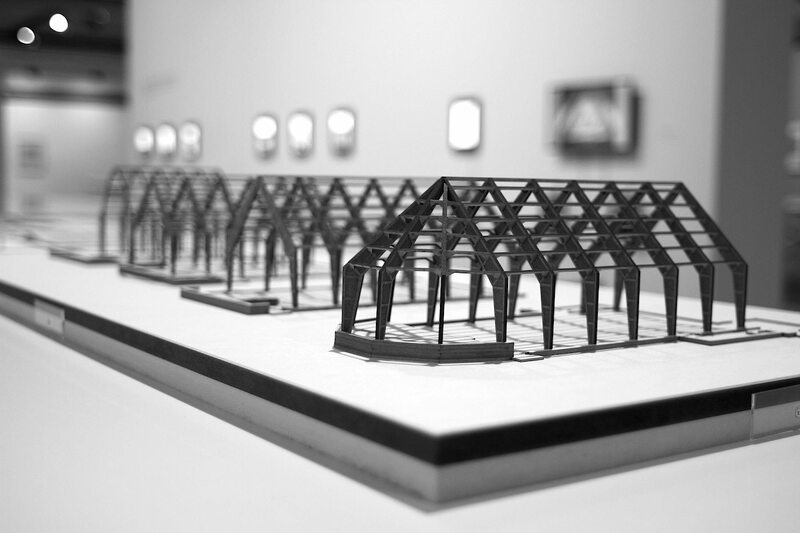 Here, hundreds of tetrahedra, made of steel pipes and welded to one another, create a stable, net-like roof support. Red glass blocks in the walls represent Christ's stigmata. 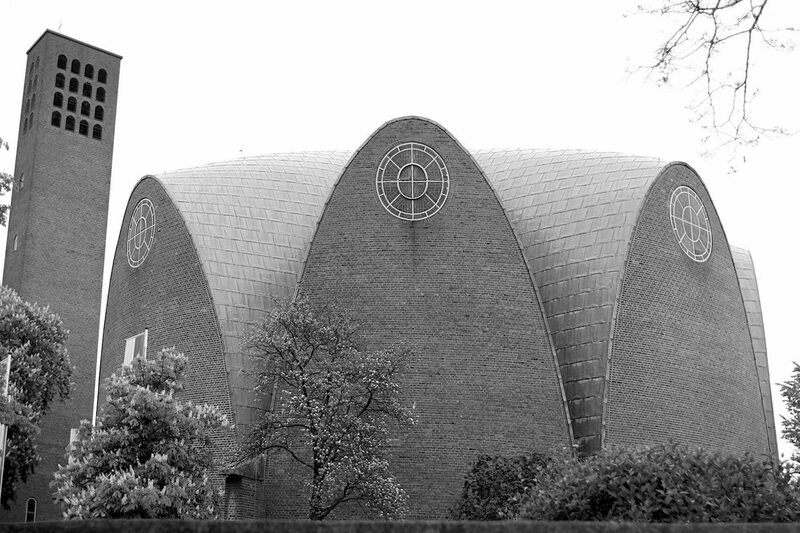 Part 2 with sacred architecture by Heinz Buchmann, Josef Rikus, Gottfried Böhm, Zvi Hecker, Sauerbruch Hutton and Paul Böhm soon on THE LINK. Von Hendrik Bohle Architekt, Autor und Stadtforscher, veröffentlicht am 28. September 2017 .